Welcome to Illusions Salon and Spa, a hair salon and spa in Colorado Springs that is all about you! We offer a friendly, inviting atmosphere and a wealth of professional salon services for men, women and families. Our team of master stylists are highly trained in order to bring you cutting edge styles and techniques along with top of the line products from the best names in the salon industry. Our Colorado Springs hair salon specializes in haircuts for men, women and children, and every aspect of hair color including custom color, corrective color, highlights and lowlights, permanent and demi-permanent color. Relaxers, perms, deep conditioning treatments. Brow tinting, lash extentions, and permanent makeup are also available at our salon. 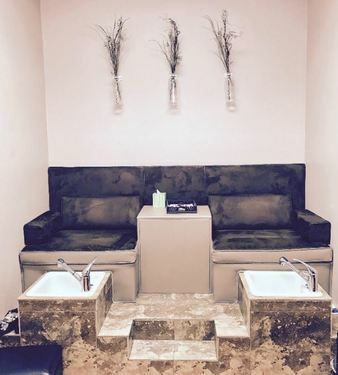 In addition to haircuts and color, our salon offers a full menu of relaxing nail salon services including spa manicures and spa pedicures. Enjoy a quick polish change on your lunch break or indulge in a set of acrylic nails to enhance your image. Also available are Esthetican services to include, Facials, Waxing, Body Treatments, Microdermabrasion, Dermaplaning and Chemical Peels. Need advice for creating a particular style or tips for gorgeous, healthy hair? We have the answers! Every appointment at our Colorado Springs hair salon begins with a personal, in depth consultation with our master stylists with advice for your particular hair type and individual needs. You will also find a wealth of professional tips from our staff on topics ranging from making your hair color last longer to how to achieve super shine. Our retail products include high quality lines such as Pureology, AQUAGE, ColorProof, Surface, American Crew, CND Shellac Joico and Image Skincare. Make an appointment soon at Illusions Hair Salon and Spa in Colorado Springs, and discover why our first time guests become loyal clients. Colorado Springs Illusions Salon And Spa offers a wide range of services for the busy career woman, active stay-at-home mom or involved retiree. As the flowers blossom in beautiful Colorado Springs this year, so should your look. If you are ready to shake things up and update your look, here are some great looks that we’ve been following, from the runway to the everyday. Women everywhere are taking the plunge and getting daring…by going shorter, adding layers and texture, or trying hair extensions. Short hair styles can be glamorous and dramatic.If you are looking to go chic and dramatic, try a ultra trendy cut like the pixie cut, which looks great on round or heart shaped faces. If you still want to keep a little play in the length, go for a shattered bob or edgy crop! These short hair style looks are fun with a untamed vibe. Medium length hair looks great with layers! ​Medium length hair (hair to the shoulders or collar bone) is really a magical length! Medium length hair has the flexibility of long hair, great for a bun or ponytail, but it can also look great down. All-over layers give hair a fuller look! Just by bumping up the length of your hair to the collar bone and adding texture, you can completely transform and revitalize your look. Long hair or hair extensions! Long hair will always be classic, but even the straight styles are evolving, showing more texture. By adding layers, either subtle long layers or layers all over, you can create bounce and movement. And between hair extensions and color like ombree or balayage, the possibilities are endless for giving long locks a lift for the new year. We offer the best hair cut and color services in Colorado Springs. Whether you are looking for a short hair cut, a medium length hair style or hair extensions, we offer professional advice and consultation to understand our client’s hair type and style preferences. The Illusions salon and spa team of stylists is ready to meet with you and transform your look for the new year.